…all the short, and cheap, and easy ways of doing that whose difficulty is its honour — are just so many new obstacles in our already encumbered road. They will not make one of us happier or wiser — they will extend neither the pride of judgment nor the privilege of enjoyment. They will only make us shallower in our understandings, colder in our hearts, and feebler in our wits. And most justly. For we are not sent into this world to do anything into which we cannot put our hearts. We have certain work to do for our bread, and that is to be done strenuously; other work to do for our delight, and that is to be done heartily. neither is to be done by halves nor shifts, but with a will; and what is not worth this effort is not to be done at all. 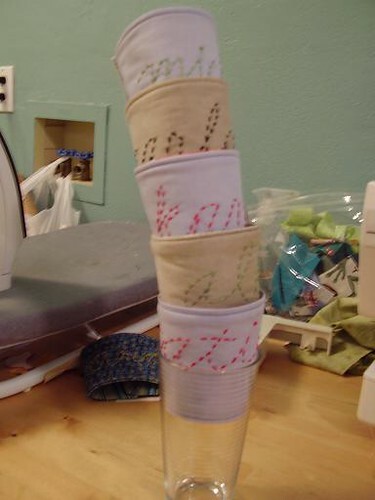 Made progress last night toward starting a band sampler: edged the 6″ strip of linen (backed with light cotton), sank a center line for anchoring, got a good night’s sleep. I also did a lot of personalizing with names on gifts this year, which was a satisfying and quick way to make handmade objects freel more special. One of the best parts about making all of these gifts during my recovery was that it really helped me to be reaching outside of myself and thinking about other people, without having to overexert or do more than my body could handle. Inside the strap of a yoga mat bag, loosely based on this tutorial. I included eyelets and drawstrings on the ones I made, and they really added that nice, professional touch. Like most of my gifts, these were made with drapes and leftover sheets. And, finally, although I don’t drink coffee or tea myself, I felt this would be an appropriate gift for my employees and coworkers. 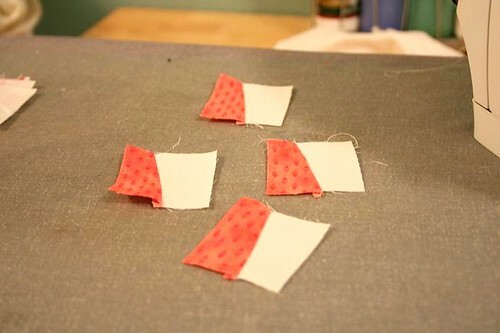 There are bright, eye-popping fabrics on the reverse sides of these, with names stitched on the outside. Inspired by pink milk and fairycakes’ tutorial. 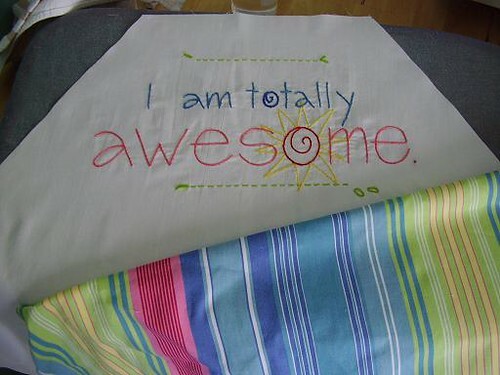 Tell us — how do you add that little personal touch to handmade gifts? I finally got access to the photos of my holiday gifts, so here are a few more examples of what I worked on during my early embroidery rush. 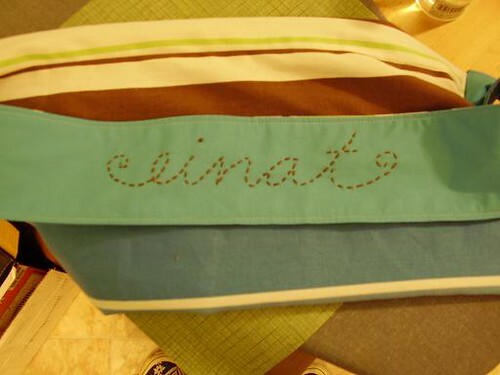 This pencil roll was made as a gift for another friend who was present for me many nights in the hospital. She is also an art therapist and brought me my journals and some art supplies because (as instructed) all I had taken with me to the hospital for my allegedly-outpatient surgery was my cell phone and a pair of flip-flops. I wanted to repay her for her kindness in an art-supply kind of way. That’s one of my favorite quotes. I sort of love that none of the colored pencils have erasers — just to emphasize Mr. Davis’ point! This is a poor picture but I loved this project. A friend of mine has been transferred to a new branch of his job and had to exchange his daily motorcycle rides for a car. This, naturally, had him pretty upset. So, I designed this illustration and made it into a CD Poket to hold music and books on tape. I also bought him a trial subscription to audible.com to help ease the hours of carpooling. Of course, I wanted his car to be perfectly clear on where his true affections lie — he will always be a biker boy. OK — we’re almost done posting photos taken with my awful camera. Stay tuned for the final embroidery installation! 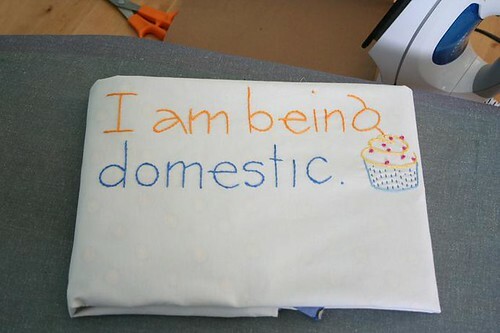 I mentioned before that during my convalescence I was drawn to fabric arts and, particularly, embroidery. Fortunately, this coincided with the holidays and I was able to handcraft every single one of my gifts for Christmas and Hannukah. 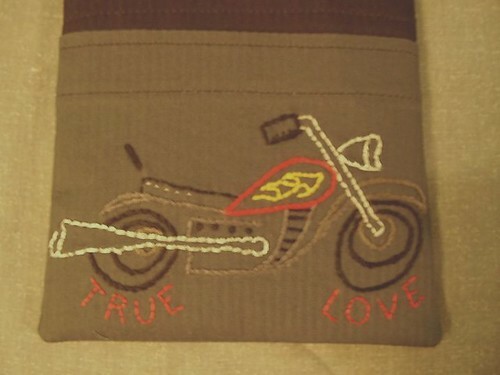 With one exception (a book I bound), all of the gifts were made of cloth (though even the book was bound with a cloth of my choosing), and nearly all of those had some personalized embroidery that I designed. 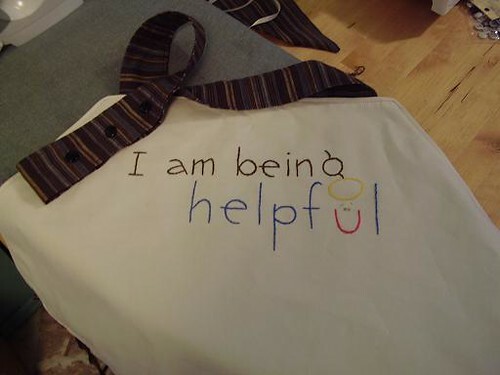 This is the first of the aprons that I made — and was given to my older sister. She had rushed to my side from far away to be with me when I was hospitalized. She kept extending and extending her stay until I finally sent her away. I’m sure her family of husband and three kids (including 2-year-old boy!) appreciated having her back. I didn’t know how else to express my deep gratitude and admiration for her after that experience. I sort of hope that when she wears it, her children roll their eyes. Another apron — this one mentioned when I posted about its mate — was for my brother. I totally adore the halo and smiley face on this one. 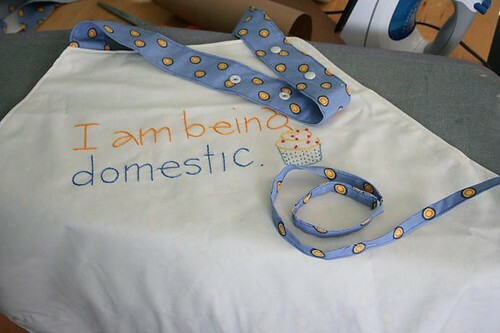 All the aprons are reversible with snaps on the neckstraps so they can be adjustable. This is a gift I made for my sister-in-law to-be, whose wedding shower is being held this weekend far away. It was made to match an apron I made for my brother at Christmas, whose embroidery announced, “I am being helpful.” Note the snaps on the neckstrap — this is to make the apron adjustable. (And also to satisfy my current obsession with snaps! snaps! snaps!) I guess being a super tall amazon lady (6’1″ tall!) makes me hypersensitive about the fallacy of one size fits all. 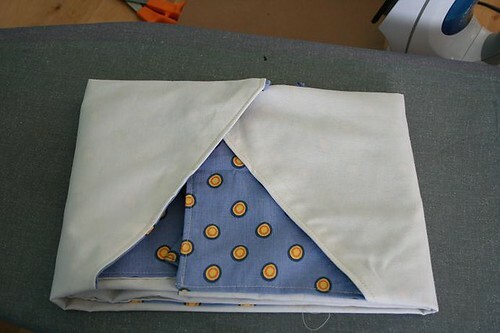 I’ve developed a method for folding these aprons before I wrap them for gifts, because I want to showcase the embroidery right when it is pulled from the wrapping. At Christmas, I found Wild Olive’s marvelous wrapping idea to be one of the best time-savers of the season. I haven’t found a better, box-less way to wrap fabric-based and sewn gifts so I’m so glad she shared. After exhausting the painting/drawing avenue of embellishment, I started pushing the idea in different directions, including the method above. 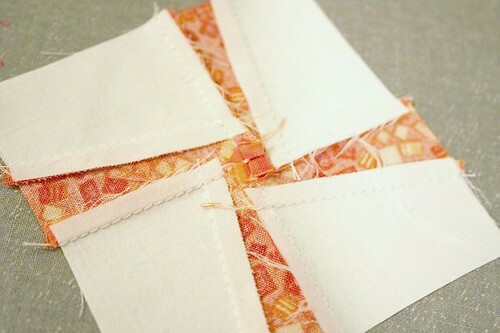 I use a die-cutter that my mother gave me (but which I haven’t otherwise found much use for) and randomly glue the shapes to the paper before folding and stitching the packages together. In my natural state, I wouldn’t be terribly interested in mass-producing dozens of precise and exact shapes. But for a throw-away item like wrapping paper, sure! At Christmas, I used a snowflake shape. 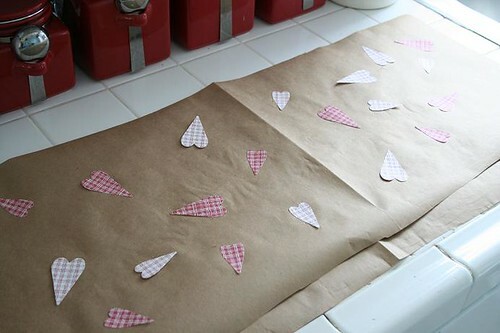 For the wedding shower — hearts, of course! 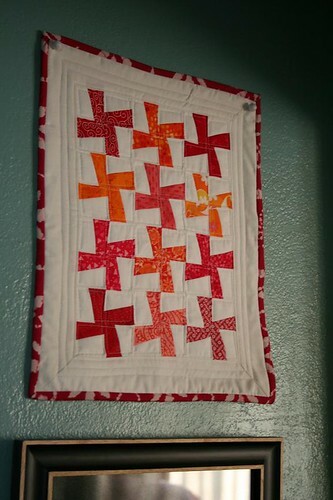 I finished the rough-draft quilt and bound it off last night. 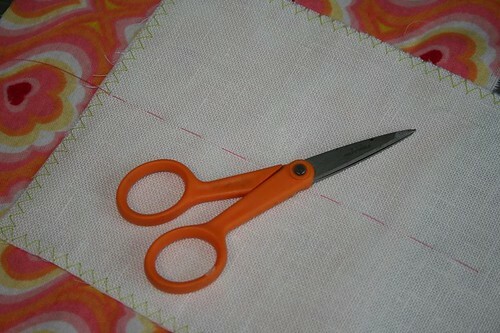 I’m a bit sad to admit that this is the first quilt binding I’ve ever completed. There are imperfections, but overall I think the quilt is adorable and I can’t wait to make a larger version of it to give away. I’ve decided to make a bunch of rough-draft quilts and hang them along this wall leading to my bedroom. 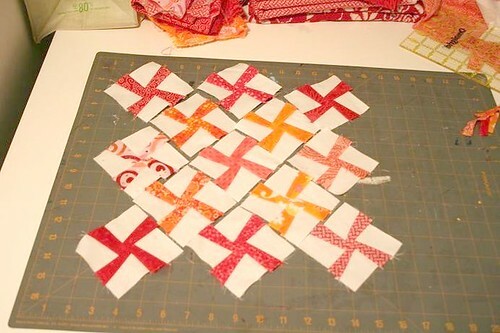 I wanted to try a “rough draft” before I jumped right in to this quilt project. I hoped it would work for a gift — a friend of mine from grad school is pregnant with a girl and I wanted to create something that was both whimsical and traditional, girly but interesting, and baby-like, not granny-like. First, the problem of colors. 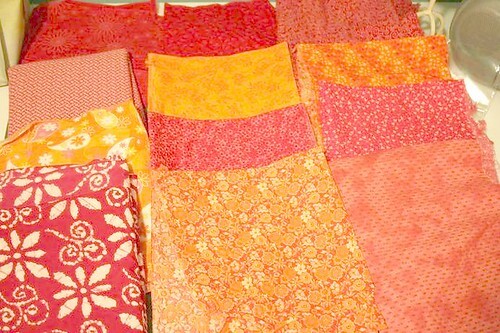 Since I primarily see quilts as cloth color studies, and because I didn’t want to resort to pastel pinks, blues, and greens, I was pleased to hit on this combination of rich pinks, reds, and oranges. I was even more pleased to find that by taking my time, I could make these simple blocks “lock together” and even managed to develop that cute “four patch” seam that Eleanor Burns is always crooning about on the backsides of her blocks. See it in the middle of the block, there? 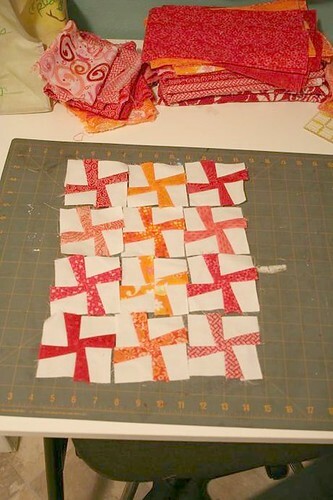 Of course, I had to manually trim all the blocks, because I tend to eyeball things and not work with templates. I’m really glad I am doing a rough draft.